The above postings are temporary project vacancy. There is no fee for SC / ST / PwD / all women candidates. Interested and eligible candidates are requested to attend the personal interview / walk in interview on the specified date mentioned above at the following venue with your all necessary documents. Time Scale Mazdoor (கால அளவு மஸ்தூர்) / Night Watchman (இரவுக் காவலர்) - 1 Posts - Basic Pay 15700 plus allowances in Tamil Nadu Government State Pay Matrix Level 1 (Basic Pay 4800 Grade Pay 1300 plus allowances in Pay Band I-A category) - 8th Std Pass with good physical conditions - Age 30 years. Interested and eligible candidates are requested to apply with the prescribed application format, along-with all supported documents, to the following address on or before the last date. The above post is temporary category vacancy. Application Registration Fee is Rs.1000 by demand draft. Interested and eligible candidates are requested to forward the prescribed applications with enclosures to the Registrar of the university. 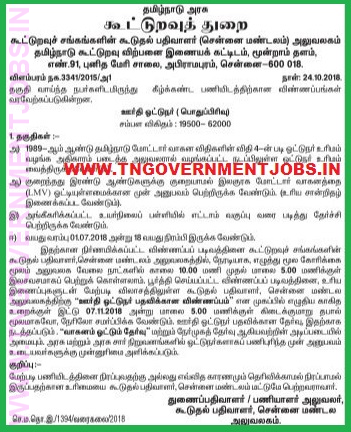 Driver (ஊர்தி ஓட்டுநர்) - 1 Post for UR Quota - Basic Pay 19500 plus allowances in Tamil Nadu Government State Pay Matrix Level 8 (Basic Pay 5200 Grade Pay 2400 plus allowances in Pay Band I category) - 8th Std Pass ; Valid driving license of Light Motor Vehicles (LMV) with minimum two years experience - Age 30 years. Prescribed application form is available in the following office address. Interested and eligible candidates may get the application form by direct or through post (by sending request letter) on or before the last date. Application Form Cover to be superscribed as "Post Applied for Deputy General Manager"
Interested and eligible candidates may forward the prescribed application form along-with all necessary documents, duly self-attested to the following address on or before the last. Minimum 25 years experience, which includes 15 years service as Group A Office in Govt / PSU in related with wind energy and allied areas. There is no fee required for application registration. Minimum two years experience required in the field of Research and Development (R&D), Design, Testing, Erection, Operation, Maintenance related with Wind Energy and allied areas. OBC candidates alone eligible to apply. Others please excuse. Rs.250 should be paid as fee for this junior engineer recruitment process. Fee can be paid in the form of Demand Draft in favouring to "National Institute of Wind Energy" payable at Chennai. NO FEE for all OBC Women Candidates. NO FEE for all OBC Persons with Disabilities (PwD) candidates. Interested and eligible candidates are requested to apply with the prescribed application form along-with all supporting documents, duly self attested to the following address on or before the above specified last date. Open to Tamil Nadu candidates only and restricted to states and UTs. 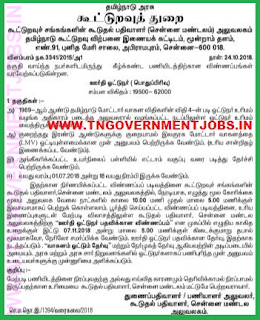 Office Assistant (அலுவலக உதவியாளர்) - 5 Posts - Basic Pay 15700 plus allowances in Tamil Nadu Government State Pay Matrix Level 1 (Basic Pay 4800 Grade Pay 1300 plus allowances in Pay Band I-A category) - 8th Std Pass with good physical conditions - Age 30 years. Self addressed Rs.25 stamp affixed long size envelope cover. Application Form must be forwarded through Post only. உயர்நீதி மன்ற வளாகம், சென்னை 600 104. Interested and eligible candidates are requested to apply through online mode of registration process through the following NLC's Official website link on or before 25th October 2018. After the online application registration process, the candidates should take the print-out of the application form and enclose all the supporting documents, forward the same to the following address on or before 30th October 2018.